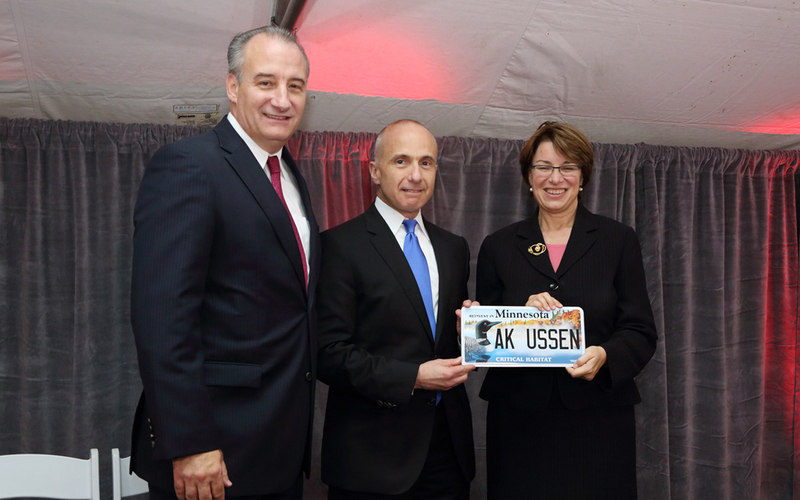 Caption: Left to right: 3M Executive Vice President, Safety & Graphics Business Group, Frank Little; 3M Vice President & General Manager, Traffic Safety and Security Division, and ARTBA Vice Chair Paul Acito; and Sen. Amy Klobuchar. More than 200 company employees, federal and state transportation officials, members of Congress and industry executives gathered September 24 in St. Paul at 3M’s headquarters to celebrate the 75th anniversary of the world’s first fully reflective traffic sign, which the company installed on a Minneapolis street in September 1939. Paul Acito, vice president and general manager of 3M’s Traffic Safety & Security Division, and an ARTBA vice chair, presided at the event. Speakers included: Acting Federal Highway Administrator Greg Nadeau, U.S. Senator Amy Klobuchar, U.S. Rep. Betty McCollum, and Minnesota DOT Commissioner Charlie Zelle. ARTBA Senior Vice President of Communications & Marketing Matt Jeanneret represented the association at the ceremony. The speakers highlighted 3M’s commitment to innovation and road safety, discussed the importance of continuing to invest in safety programs, and spotlighted the need for Congress to pass a new surface transportation investment bill.